Rubber Process Analyzer - The latest technology with the most accurate and reproducible data available. The TA Instruments RPA elite rubber process analyzer (RPA) is the most advanced rotorless oscillating shear rheometer dedicated to the complete characterization of polymers, rubber and rubber compounds at all stages of manufacture. The RPA elite provides invaluable viscoelastic data on materials that are uncured, through the curing process, and in situ cured materials. The ultra-rigid test frame, high-resolution variable direct drive motor, ultra-stiff wide-range torque transducer, and precision temperature control provide the most precise and accurate torque, viscosity and viscoelastic properties of elastomers over the widest ranges of testing conditions. 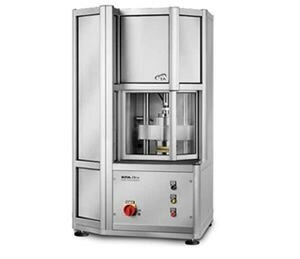 The fully flexible architecture of the RPA elite enables advanced testing capabilities beyond any other rubber rheometer including: complete post cure viscoelastic characterization, fully programmable sealing pressure, large amplitude oscillatory shear (LAOS) and arbitrary waveform deformations.